The Sigma SD15 is a new DSLR camera which utilises the the same 14.06 megapixel Foveon X3 sensor technology as its predecessor, the SD14, and the company's range of premium DP-branded compacts. Other key features of the long-awaited SD15, which was first announced way back at Photokina 2008, include the True II processor, a 3 inch, high-resolution 460k dot LCD screen, extended ISO range of 50-3200, 77-segment AE sensor, a continuous shooting speed of 3 frames per second for up to 21 RAW images, and a 100,000 exposure shutter life. The Sigma SD15 is available now for around £900 / $989. Sigma's expertise and renown is in providing good value lenses and accessories to Canon, Nikon and Sony digital SLR users who don't want to fork out top dollar for those maker's own branded products. 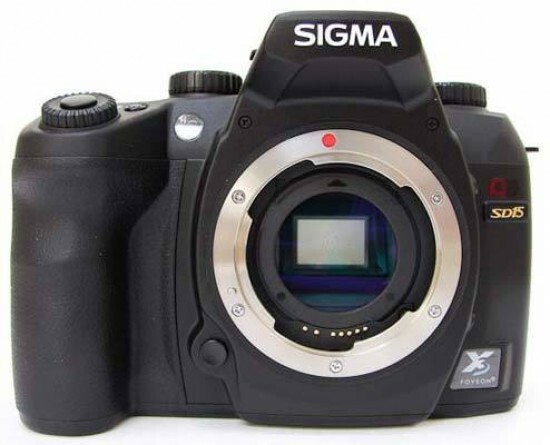 Back in 2002 Sigma decided that, since it already had optical expertise, why not partner with someone who can provide the requisite sensor technology, cut out the middleman and bring out its own class leading DSLR? That was the sound enough theory. In practice it's worked out less smoothly for this plucky underdog. Sigma's three other DSLRs to date - the SD9, SD10 and SD14 - have enjoyed a mixed reception, falling short on delivering on the promise indicated at the time, and simply puzzling many. The 14.06 effective megapixel SD15, which succeeds 2006's SD14, was mooted over a year ago but has only just made it to market at a suggested £900, body only. While that may sound pricey and such a delay foreboding, it's worth recalling that its predecessor was launched at around £1,100, and the SD15 can now be picked up for a more realistic £780 online. It's only Sigma's fourth DSLR since 2002, which seems like 100 years ago in the fast-moving world of digital photography. 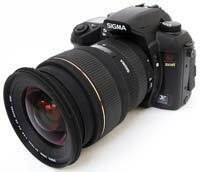 Even after all this time, Sigma's system still feels untried and untested. So why should one take a chance and opt for the SD15 over what Canon, Nikon, Pentax, or Sony could offer for the same price from their respective ranges? Sigma's not so secret weapon, and to be honest its DSLR's main selling point, is the Foveon X3 CMOS sensor at the heart of the SD15 and its predecessors. While conventional (non-Foveon) sensors are good at detecting the intensity of light, they miss a lot of colour information claims Sigma. To combat this the Foveon chip features a unique three-layered pixel configuration - one layer for red light, one for green and one for blue. Or to get more scientific, by utilising its three silicon-embedded layers of photo detectors, stacked to take advantage of silicon's ability to absorb red, green and blue light at different respective depths, Sigma claims it reproduces colour more accurately than conventional sensors. Certainly it delivers images with a different look and feel than we are used to, with subtle tones and shading that makes shots appear less obviously digital and in fact a little more painterly. A polite way of saying they can look a little soft. For the duration of our test period we were also supplied with a Sigma 24-70mm f/2.8 DG Macro and a 70-300mm f/4-5.6 DG OS lens, available from around £300 and £400 respectively; the telephoto zoom stabilised to avoid blur at longer focal lengths. This solid pairing could be conceivably the only set up the keen amateur may need, though they will have shelled out nearly £1600 for the privilege. Sigma claims the shutter release mechanism will last 100,000+ captures, so plenty of opportunity to capture that winning shot. Without lens attached, the SD15 feels deceptively lightweight, yet solid to the touch. Deceptive, because the camera actually weighs a not inconsiderable 680g without attached glass. With 24-70mm lens screwed onto the front however it's like you're hefting a couple of bricks. Its body-only dimensions are a tank-like 144x107.3x80.5mm. Other enticing features include dust protected mount (protection removable should this not prove 100% effective and you need to clean the sensor after all), light sensitivity stretching from ISO100 to ISO1600 (expandable to ISO50 and ISO3200 at either end) plus the ability to shoot common JPEG (Fine, Normal or Basic compression levels) as well as best quality RAW files, but not in tandem. Sigma Photo Pro 4.1 software for RAW file conversion is supplied on a pair of CD ROMs in the box; one each for Windows and Mac users. 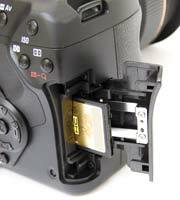 Photos are written to the widely available SD and higher capacity SDHC cards, thankfully housed in a separate compartment to the battery, beneath a side-mounted flap. When it comes to action photography, maximum shooting speed is a fairly modest three frames per second (fps), albeit as RAW files for up to 21 consecutive frames. Shoot a JPEG though and, because of the quirks of the sensor, you're left not with a 14MP image however, but one comprised of a total of just 4.6 megapixels. OK, so the end result might look more like an eight or 10 megapixel shot when viewed on your desktop, but £900 for a four to 5MP camera sounds like something from the 1990s. Eschewing convention further, there's also no video mode nor Live View compositional facility to be found on the SD15. Since the shooting mode dial has been pared down to the creative quartet of Program, Aperture Priority, Shutter Priority and Manual, the top plate layout appears a little unfinished at first, as if its designers have just stepped outside for a moment. The SD15's back plate layout looks similarly sparse at first glance, with quizzically small buttons that seem dwarfed by its frame. In fact all the essentials are there, save for a rear command dial commonly found on rival DSLRs in this price bracket. 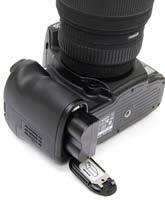 Unlike other pro-level DSLRs, the Sigma comes with both pop up flash and vacant hotshoe for accessory flashgun. Pictures are composed via a decent sized optical viewfinder offering 98% coverage and 0.9x magnification factor, with an equally adequate 3-inch LCD just below, that, in offering a 460k resolution, falls between entry level and semi pro DSLR in terms of spec. It's not the most user friendly camera we've handled - again, Sigma has no truck with current conventions and as we've mentioned the screen cannot be used for shot composition, just reviewing - but again the essentials are all here, located via a press of the 'QS' (Quick Set) button. With practice operation speeds up. Viewed front on, the Sigma SD15 appears angular and tank-like; not always a bad thing, especially as you want a camera built to last and able to withstand the odd glancing knock if spending near £900 for the privilege. A pop up integral flash hides just above the lens, set forward of a vacant hotshoe for Sigma's EF-530 accessory flashgun, to name just one recommended option from its extensive range. Top right of the lens mount, looking at the camera lens-on, is a sensor for use with an optional RS-31 remote control. Tucked closer still are a button for adjusting the flash, and of identical size below it an unmarked button that is actually a depth of field preview button, should you want to get an impression of how your shot will look before you actually take it. As we've found on its DP series compacts, Sigma seems to like its unmarked or oddly labeled controls, which at times make its cameras seem like puzzles to be unraveled. Over to the left hand side of the lens mount, we find near the base the lens release button - smaller than those of competing brands but perfectly workable - plus directly above, a large porthole shaped window housing the noticeably bright AF assist lamp. This snuggles next to the large, textured handgrip, around which it's possible to comfortably wrap three fingers, leaving the thumb to rest in a padded indentation on the backplate. This of course leaves the forefinger comfortably free to hover over the shutter release button, unusually encircled by the command dial. But so far, so ergonomic, and as we've noted, after some initial head scratching over Sigma's quirky way of doing things, things start to fall slowly into place. The SD15's top plate resembles an old Roberts transistor radio, with not one but two rangefinder-like dials. Viewing the camera from the back as anyone using it will, over to the right we have a shooting mode dial that again looks a little empty, featuring just the four options of program, aperture priority, shutter priority and manual. Not for Sigma the tomfoolery of a plethora of auto, scene and subject modes usually found on all-singing, all-dancing DSLRs in this price bracket and below. Next to this right hand side dial we have a smaller than average top plate LCD window displaying key shooting information at a glance, such as battery life indicator, number of shots remaining, metering mode, selected aperture and shutter speed; the latter pairing adjustable with a finger flick of the command dial. Just in front of this sits a small button marked with self explanatory bulb icon for turning the handy LCD illumination on/off, and on the forward slope of the handgrip, the aforementioned shutter release button/command dial configuration. Across at the left hand side of the top plate we find the second dial, or 'drive dial'. As it sounds, with a twist the user can swap between single shot and continuous/burst shooting. This also doubles up as the on/off switch, radio-stylee, and additionally includes settings for two or 10 second self timer, mirror up and auto bracketing modes. Looking down on the above the user benefits from not being confronted with an overly cramped or busy display, meaning it's relatively simple to quickly get to the desired feature or function. With a flick of this dial to single shot shooting mode the user can be up and taking pictures in a couple of seconds. OK, not the fastest ever, but then Sigma cameras are best appreciated by those who prefer their art at a more leisurely pace. The 5-point AF system is, on paper, nothing to write home about, but in practice swift in response, though busier scenes can confuse the auto focus, the lens audibly shifting back and forth trying to lock onto target. Single shot JPEGs are committed to memory in just under three seconds. Raw files are more like five. Both are perfectly adequate given the circumstances. Moving to the backplate where the 3-inch, 260k-dot LCD screen takes centre stage, the user is presented with 14 small buttons dotted about the space like chocolate drops sprinkled on a cake, their positioning feeling almost that random. Also, with key options spread between separate function, menu and quick set buttons, it's initially difficult to know what you should be pressing first - though the latter is the best bet. Still, drawing the eye like a beacon immediately above the screen is pentaprism viewfinder offering 98% coverage and 0.9x magnification factor. Whilst not the biggest nor the brightest optical viewfinder found on a DSLR, it's again adequate for purpose. Just above it sits a large diopter adjuster slider, much easier to access than the tiny wheel-type affairs set into the side of other DSLR's eyepiece cups, and compared to them given undue prominence. Perhaps research has indicated that most of Sigma's customer base are spectacle wearers? To the left of the viewfinder is the 'func' (function) button as aforementioned. Press this and the user is presented with a grid-like virtual version of the view through the optical viewfinder. To the left, the right and along the bottom of the screen are more key essentials. To the left the current shooting mode, metering mode and ISO setting are presented, and on the right shutter speed and aperture, shots remaining and exposure compensation setting. A toolbar along the bottom meanwhile presents the selected drive mode, flash options (standard fill-in flash, red eye reduction, slow sync, rear curtain sync and wireless TTL flash mode) and remote control channel setting. The options on this bottom toolbar can be tabbed through and selected using the four directional control pads to the right of the screen that encircle a familiar 'OK' button. The others on the main part of a screen require a corresponding press of dedicated button or twist of a dial to effect and implement any changes. Just below the function button is the self explanatory 'menu' button; press this and a long list of mainly set up options appear on the LCD, clean legible white type on black, each subsequent option illuminated in non threatening baby blue as the user tabs through them. It's here the user can carry out a custom white balance or tweak 'picture settings' to include contrast, sharpness, and saturation plus swap between SRGB and Adobe RGB colour space in camera. It's also in this menu that the 'extended mode' needs to be first enabled before the photographer can access the extended range of ISO options, beginning at ISO50, instead of ISO100, and going up to ISO3200. Card formatting, date and time settings, file numbering and auto picture rotation are among the more regular suspects you'd expect to find in such a set up menu. The next button down from menu is the equally familiar playback button for reviewing shots at leisure. A pairing of buttons to the top right of the camera back allow the user to variously zoom into images to check detail or display a sequence of recent shots as thumbnails. A press of the 'i' (information) button one down from playback brings up a plethora of shooting info pertaining to the shot on screen at the time, including histogram revealing not only areas of brightness but also individual colour channels, along with white balance selected, ISO speed, focal length, date, time and the ilk. Staying to the left of the LCD, the next button down is illustrated with an enigmatic asterisk, which the SD15's manual identifies as the 'modify menu' button. Press it when in capture mode and nothing happens. However in review mode another press and the user is presented with the ability to earmark certain images or groups for direct printing, kick start a slideshow, manually rotate images, or mark and lock them for preservation. By contrast then the bottom button of the five to run down the left hand side of the screen is a very useful dedicated delete button. Moving over to the right hand side of the SD15's screen and top right we have a pairing of buttons for auto exposure lock and aperture/exposure compensation, and, just below and to the right, a further three for summoning up and adjusting ISO speeds, swapping metering modes and adjusting the AF point when in capture mode (or zooming in when in review mode). Just above the previously mentioned control pad is probably the most consistently used button on the SD15's backplate, the 'QS' or Quick Set button. As it sounds, this pares proceedings down to the bare essentials to save time. It's here you get a creative choice of capture options, ranging from pre-optimised portrait and landscape settings to sepia and black and white, neutral and standard colour options, plus vivid setting. There's also the ability to swap between Fine, Normal, Basic or Raw shooting options in a thrice, and between standard auto and manually selectable white balance settings. Changes are effected to all of the above by simply selecting the corresponding button on the four-way control pad and scrolling through the options presented at the four points on screen. The last button on the back plate is a slightly extraneous cancel button, a press of which in most instances simply turns off the LCD screen. With a slot for SD/SDHC card nestling under a sliding door on the camera's right flank - if still viewed from the rear - to the left hand side we get a rubber flap covering separate USB 2.0, AV out and power in ports, and above and below, variously PC sync and cable release sockets, indicating if needed the SD15's semi pro mettle. At the sturdy base of the camera we have a screw thread located not at the mid point of the base but the mid point of the lens, plus sliding catch protecting the battery compartment, lithium in cell hidden within the base of the handgrip. Battery life is good for a respectable 500 shots from a full charge. Again, whilst not up there with the best performing DSLRs, it's again perfectly adequate.